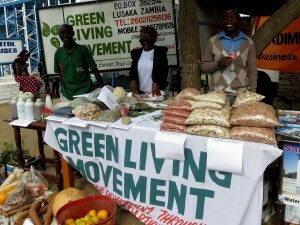 GLM Zambia supports sustainable development and community livelihoods in rural Zambia. Its work focuses on sustainable land management, climate and environmental awareness, income diversification as well as capacity building and advocacy. Most rural Zambians are small-scale farmers who depend on agriculture, but cannot often afford synthetic fertilisers which are expensive and also harmful for the environment in the long term. 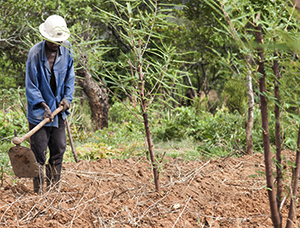 GLM Zambia trains smallholder farmers to help them adopt sustainable land management practices, such as agroforestry, organic farming and tree planting. These agroecological farming methods enhance and sustain the productivity of land through integrated cultivation of farm crops and nitrogen-fixing trees. They also use compost and other natural substances for fertilising crops and pest control. 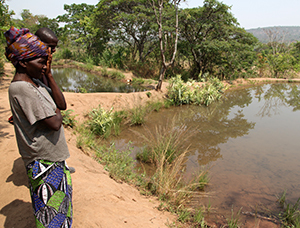 Adverse impacts of climate change, such as increased droughts, floods and new pests, are already visible in Zambia. GLM Zambia creates awareness of the causes and effects of climate change among rural farmers through community awareness events and radio shows, and supports the farmers to mitigate and adapt to the impacts. The locally applicable adaptation strategies include sustainable agriculture, diversified income sources and environmental conservation. 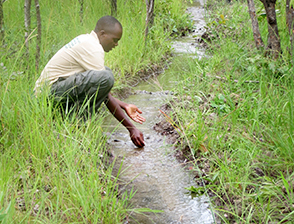 Through its networks, GLM Zambia also carries out advocacy work on climate issues. Over the years, many development projects have concentrated on developing community capacity to attain food security. This alone is, however, not enough, since long-term food security also requires income security. People also need money to pay for education, health services, clothing and other basic necessities. GLM Zambia supports initiatives that diversify the income sources of local communities, hence enhancing their capacity to earn money and improve their livelihoods. These projects include installation and management of hammer mills, beekeeping and fish farming, among others. GLM Zambia organises training and exposure visits for farmers in order to enhance their capacity in areas such as leadership, conflict management, financial management as well as project monitoring. This helps the communities to take responsibility for development activities and to manage projects independently and competently. 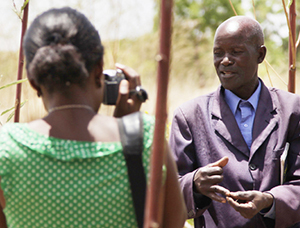 GLM also coordinates community exchange visits which provide a platform for exposure and hands-on learning experiences which allow farmers to interact with and learn from one another. Most rural communities have limited contact with policy- and decision-makers. They are not aware of their rights and do not know how to claim them to support the development of their communities. 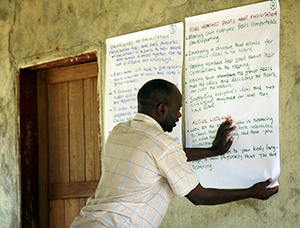 GLM Zambia trains farmers in campaigning and lobbying skills to empower the communities to engage in evidence-based advocacy and to increase their dialogue with traditional and political leaders. GLM Zambia creates awareness among rural communities on policy development and various national development issues. It also documents its experiences and lessons learnt and shares these with like-minded organisations at the local, regional and international fora. GLM Zambia is also a member of various civil society networks which provide a platform for learning and sharing experiences with other actors. 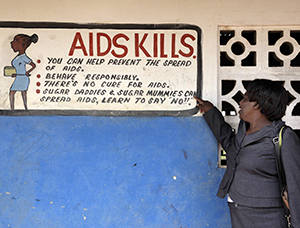 GLM Zambia mainstreams HIV/AIDS awareness and sensitisation in all its activities among its partner communities. It also promotes gender equality by ensuring the equal opportunities of women to participate in GLM’s projects and related decision-making. Women form the majority in some of the farmer groups that GLM works with. 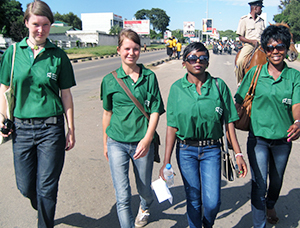 GLM Zambia encourages youth participation in its work and partners with academic institutions to provide students the opportunity to gain hands-on field research experience in their fields of study. This supports the young people to become knowledgeable leaders who are able to implement programmes in a well-researched and informed manner and who can also become GLM ambassadors for social change and environmental protection. 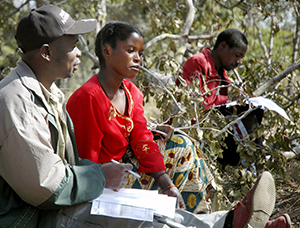 GLM Zambia provides consultancy services to local and international development agencies on issues such as participatory appraisals (PRA/PLA), community mobilisation, and monitoring and evaluation. Green Living Movement © 2012. All rights Reserved.